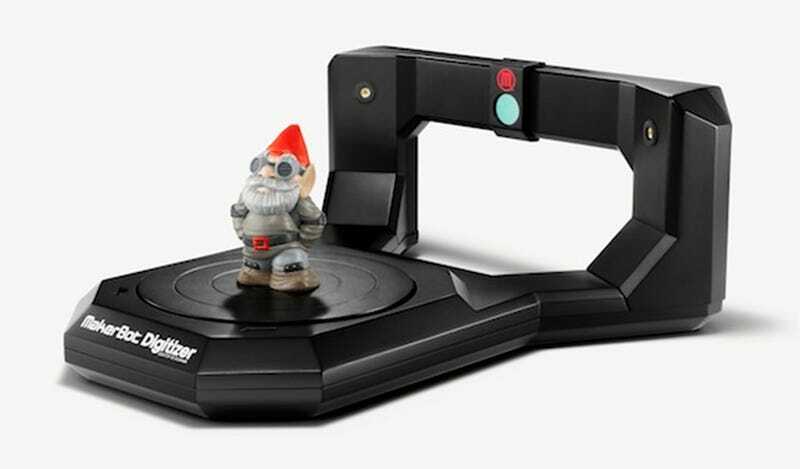 Today MakerBot introduced what's basically a Xerox machine for physical items: the Digitizer Desktop 3D Scanner. It'll make 3D-printing at home a lot easier, but that doesn't mean it'll make it cheaper. We saw it teased back in March at SXSW, but this is the first time the Digitzer has been available. As a refresher, it scans an object with a camera and a pair of lasers, and instantly renders you a 3D design that can be used to make your object, no technical know-how required. The machine costs $1,400 and is available for pre-order now, shipping in the middle of October. Of course, you need a Replicator to go with it. But it takes out the 3D printing middleman in an important way. Need a spare part? No need to send off for it, you can just scan it and then print it on your machine. You don't need any kind of CAD or design experience.